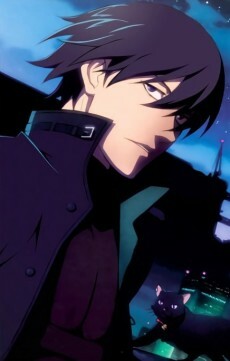 His codename is Hei, which means black in Chinese. Hei is a very talented contractor, his Messier Code is BK-201. Hei lives two lives in the series. In public he is Li Shengshun, a foreign exchange student from China. He is very nice and well mannered. He lives in the Umitsuki apartments and is always working a new part-time job.He has a huge appetite, not unlike most anime characters. Hei's other life is of a Contractor called BK-201 and also the Black Reaper, mostly by other Contractors. Before becoming a contractor Hei was an assassin which earned him his nickname. Hei is usually seen on the job in a mask and a dark bullet proof coat. Hei has the ability to manipulate electrons and can also disturb matter on a quantum level.